Lymphatic filariasis (LF) is endemic in more than 80 countries with approximately 120 million people infected and over a billion people at risk . Mass drug treatment is one of the strategies that may allow the elimination of this public health burden to become a reality. This effort will require good monitoring tools for decision making, for both the initiation (mapping) and cessation (demonstration of interruption of transmission) of LF elimination programs. Microfilaria (Mf) and antigen (Ag) testing have become standard methods to measure the impact of LF elimination programs . However, pockets of residual infection may be difficult to recognize because the sensitivity of the Mf and Ag tests are reduced as the intensity of infection decreases and because practical sampling strategies have not yet been developed that will identify small foci where infection persists. Therefore, it is important to explore other measures such as entomologic techniques and new serologic assays for program monitoring and evaluation [3, 4]. Measuring prevalence of Wuchereria bancrofti infection in mosquitoes has proven to be useful for monitoring LF transmission during mass drug treatment programs [5, 6]. Mosquito dissection is the most accepted method, but when Mf prevalence and density are low, the utility of this technique decreases. Polymerase chain reaction (PCR) is more sensitive than dissection, and it has the practical advantage of being useful for testing pools of mosquitoes in areas of low transmission. However, PCR methods have not yet been standardized for use in the LF elimination program [7, 8]. Antifilarial antibody (Ab) assays have been proposed as potential monitoring tools. Antibody responses to W. bancrofti develop prior to antigenemia, making them early markers of exposure and infection [9–11]. In addition, monitoring isotype-specific responses to filarial Ag may provide a way to distinguish between exposure and active infection. 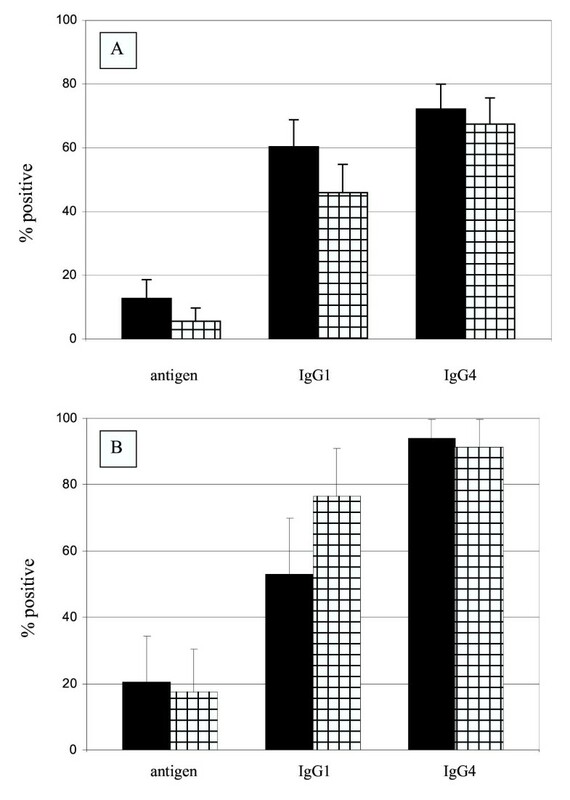 Using crude Brugia adult worm extracts as an antigen source, studies comparing antibody responses in high and low transmission settings have provided evidence that antifilarial IgG1 response serves as a marker of filarial exposure, while the antifilarial IgG4 response is associated with the presence of circulating filarial Ag [10, 12–14]. Finally, previous studies, of both LF and onchocerciasis, suggest that the lack of antifilarial antibody responses serve as a useful indicator of the absence of transmission following implementation of control programs [15–17]. Mapping approaches have been used to determine the geographic distribution of filarial disease and infection at national and regional levels [18–23]. These large-scale spatial assessments have been especially useful for identifying implementation units for mass treatment programs, but there is some indication that micro-scale spatial heterogeneity exists in LF infection [24–26]. Such heterogeneity could be problematic for deciding where to initiate mass treatment, since isolated pockets of transmission may be missed during national-level mapping to identify areas that require intervention . Continued low-level transmission in small areas also might be missed by the large-scale sampling, currently recommended by WHO to determine whether transmission has been interrupted, resulting in a premature stoppage of mass treatment . We conducted a study to characterize Mf, Ag, and Ab responses both temporally (before and after mass treatment) and spatially, in an area of initial low W. bancrofti infection prevalence. The combined use of these tools allowed us to develop a more complete picture of transmission dynamics in our study site and helped us to document the reduction of transmission following treatment. We believe our results provide a further justification for using antibody assays to monitor filarial exposure. The study was carried out in Mapou (Léogâne Commune), Haiti, a W. bancrofti-endemic community with approximately 1,000 residents located roughly 30 kilometers west of Port au Prince (Figure 1). Mapou is situated linearly along a road and adjacent to a seasonal river (Figure 2), approximately 8 kilometers from the coast. 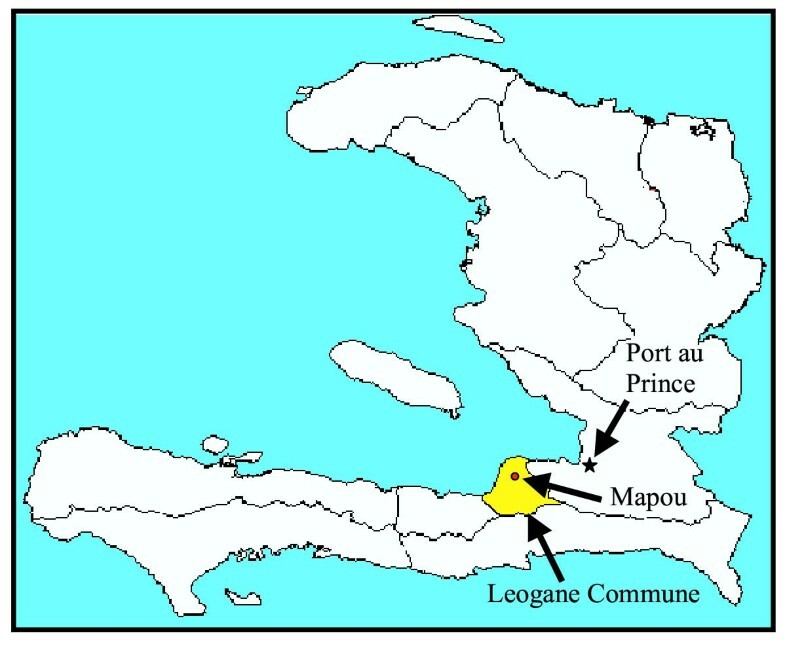 Map of Haiti, indicating the commune of Léogâne and the community of Mapou. GPS generated map of Mapou, showing houses, schools, mosquito trap locations, and other landmarks as indicated. The study consists of two defined groups, the sentinel site and the cohort. The sentinel site group is a convenience sample of individuals who lived in Mapou during 2000 and 2001. The cohort data is made up of persons in the sentinel site who have adequate stored sera from both 2000 and 2001. Both groups are described in greater detail below. Mapou is one of four sentinel sites chosen in Léogâne Commune to monitor the impact of a Commune-wide LF elimination demonstration project . These sites were surveyed before and after the first round of annual mass treatment for W. bancrofti infection, in 2000 and 2001, respectively; demographic data were also obtained during these surveys. Before initiating monitoring activities, the purpose of the testing was explained to the community in Haitian Creole and individuals were asked to participate. Verbal informed consent was obtained from all individuals. The protocol for this study was reviewed and approved by the Institutional Review Board (IRB) of the Centers for Disease Control and Prevention (Georgia, USA), the IRB of the University of Notre Dame (Indiana, USA), and the Ethical Committee of the Sainte Croix Hospital (Léogâne, Haiti). Data were entered into an EpiInfo 6 database. Every house in Mapou was mapped using a differential Global Positioning System (DGPS) . DGPS is used to remove much of the error associated with ordinary Global Positioning System (GPS) mapping methods. GPS error was computed by comparing GPS readings at a known location (Sainte Croix Hospital) for all available GPS satellites with the location's true coordinates. This error term was used to calibrate the field mapping work, reducing horizontal errors to an average of less than 3 meters. The TSC1 Asset Surveyor with Pro XRS receiver was used to enter the data and PathFinder software (v. 2.90) was used for data transfer and differential correction (Trimble Navigation Limited, Sunnyvale, CA, USA). Nocturnal "finger-prick" (capillary) blood was collected (between 7 and 9 PM) in June-July 2000 (pre-treatment) and July 2001 (post-treatment). Blood smears (20 μl-thick films) were prepared in the field and later stained with Giemsa and examined for the presence and number of Mf as described elsewhere . The same finger-prick was used to collect 100 μl of blood for the immunochromatographic test (ICT, AMRAD, New South Wales, Australia), which was used to determine Ag status (positive/negative). Studies have shown that this test is more than 99% sensitive in persons with detectable bancroftian microfilaremia . Additional finger-prick blood (200 μl) was collected at the time of thick smear preparation and antigen testing for use in antibody assays. After collection, blood was refrigerated overnight and the serum was separated by centrifugation the following day. Sera were stored at -20°C. 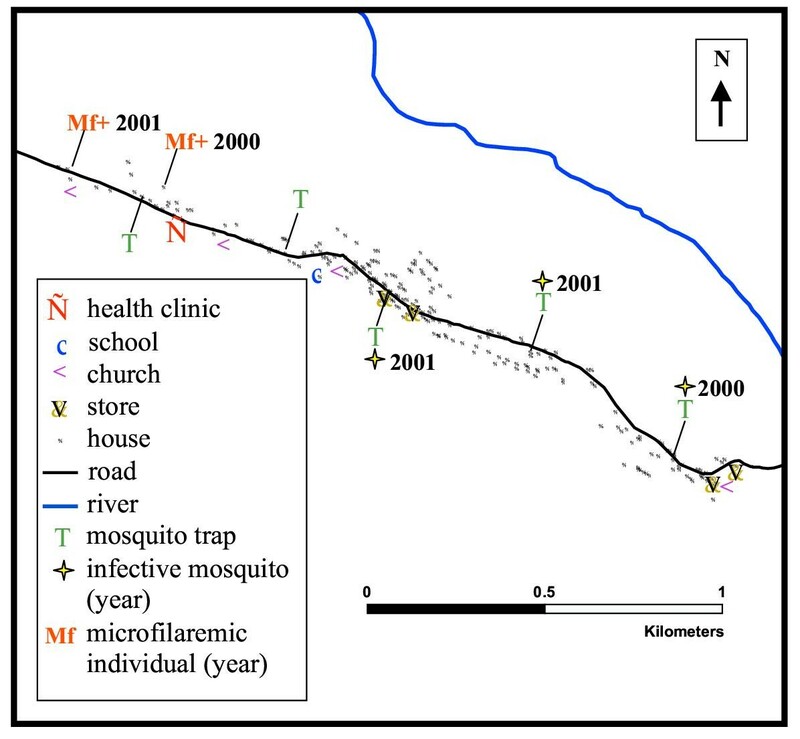 W. bancrofti infection in the mosquito vector was assessed with year-round mosquito collection in Mapou. Culex quinquefasciatus is the primary vector of LF in Haiti [29–31]. Gravid traps were used to collect female C. quinquefasciatus mosquitoes, seeking to oviposit. Such mosquitoes have blood fed at least once. Mosquitoes were trapped for four consecutive nights fortnightly at five trapping locations (Figure 2). Approximately half of the mosquitoes were dissected individually to determine numbers and stages of W. bancrofti larvae present . From this, we estimated the prevalence of infected and infective mosquitoes in Mapou. An infected mosquito was defined as a female C. quinquefasciatus mosquito containing any stage of W. bancrofti larvae in any body segment and an infective mosquito was defined as a female C. quinquefasciatus mosquito containing a 3rd stage W. bancrofti larvae in any body segment. The remainder of the mosquitoes was used in PCR assays to detect W. bancrofti DNA as previously described . The first mass drug administration (MDA) of diethylcarbamazine (DEC) and albendazole took place in October 2000. DEC tablets were offered to all persons older than two years. Women of childbearing age were excluded from albendazole treatment at the request of the Ministry of Health and Population, as described elsewhere . Persons with adverse drug reactions were treated at distribution points, reference centers, or Sainte Croix Hospital, depending on the severity of the problem. To monitor the impact of mass treatment on filarial infection, we investigated a cohort of persons with information for both the pre- and post-MDA periods. Persons from the sentinel site who had sufficient volumes of stored sera from 2000 and 2001 were included in these paired analyses. Filarial specific antibodies were measured in sera from the cohort. The paired sera were assayed for antifilarial immunoreactivity (IgG1 and IgG4) with crude Brugia malayi Ag by enzyme-linked immunosorbent-assay (ELISA) [33, 34]. Serum samples were assayed in duplicate at a final dilution of 1:50 for both IgG assays. Serum samples from non-traveling North Americans were run in parallel as controls. For both assays, serum samples with antibody levels greater than or equal to the mean antibody level for non-traveling North Americans plus 3 standard deviations (SDs) were considered to be antibody positive. In the contour map analysis, serum samples with antibody levels greater than the mean antibody level for non-endemic residents of a mountainous area of Haiti plus 3 SDs were considered to be antibody positive. Univariate differences in proportions (Ag and antibody prevalence) were analyzed using the Mantel-Haenszel chi-square or the Fisher exact test. Univariate differences in continuous measures between groups (antibody level and average distance to the residence an Ag-positive person) were compared using pooled t- and Kruksal-Wallis tests. Univariate analyses on paired data (pre- and post-MDA values) used Wilcoxon matched-pair signed rank tests for continuous variables and McNemar's test for binary variables. All p-values were computed in a manner to account for sample size. Mapping was used to highlight the spatial distribution of antifilarial antibody responses and treatment coverage. Average household responses were calculated by summing antibody responses of all tested persons in a given household and then dividing the sum by the total number of tested household residents. Household antifilarial IgG1 levels were categorized as negative, low positive, and high positive. Negative antifilarial IgG1 levels were previously defined. Among households with positive antifilarial IgG1 responses, the low positive antifilarial IgG1 levels were defined as those with a mean value less than the median value of households with at least one positive person; high positive antifilarial IgG1 levels were defined as those with levels greater than or equal to the median. Household treatment coverage was defined as the proportion of residents in each household included in the cohort who reported having taken antifilarial drugs during the MDA. Three levels of coverage were defined, based on median household coverage (90%): no coverage, low coverage and high coverage. Households with coverage less than the median (1–90%) were defined as low coverage, those with more than the median (91–100%) as high coverage. To provide a descriptive representation of the data, a smoothed contour map was created by summing the antifilarial IgG1 levels for residents by household and then using linear inverse density weighting of the distance to each household within 50 meters of each point on the map to create the contours . Quartiles of these summed (cumulative) levels are represented by shades of red. Each contour line represents 100 units of change in antifilarial IgG1 levels. ArcView (v3.3) and the Spatial Analyst Extension (v2.0) were used to produce antibody level maps (Environmental Systems Research, Inc., Redlands, CA, USA). Clustering was further assessed using SatSCAN (v. 2.1; National Cancer Institute, Bethesda, MD, USA); the number of events in an area was compared to the number expected based on a Poisson distribution with a known underlying population at risk . Multiple linear regression conducted on the cohort was used to investigate the association of Ag-positive persons and the antibody responses of other (Ag-negative) members of the community. Therefore only people who were Ag-negative in 2000 were included in the regression analysis. Ag-positive people were considered potential sources of transmission, as there were not sufficient microfilaremic persons in the community. The outcome variables were individual antifilarial antibody levels (IgG1 or IgG4) in 2001. The variable of primary interest was the distance to the nearest residence of an Ag-positive person in 2000. The distance was computed from the residence of Ag-negative people in 2000 to the nearest residence of an Ag-positive person in 2000 [37, 38]. Other variables in the models included a person's treatment status, age, and gender. Since multiple people from a single household could be included in our analyses, we used generalized estimating equation methodology to account for the resulting within-household correlation [39–41]. We assumed an exchangeable correlation structure, which assumes a constant correlation between all persons within a given household. The SAS (v8.2; SAS Institute Inc., Cary, NC, USA) procedure PROC GENMOD was used for this modeling. In 2000, the median age of the Mapou population was 18 years, 50.7% of the population was female, and 72.5% of the residents reported receiving antifilarial drugs in the first MDA (Table 1). Five hundred eighty-nine residents were tested in 2000, while 269 were tested in 2001. The overall prevalence of antigenemia and microfilaremia decreased after treatment (Table 1). 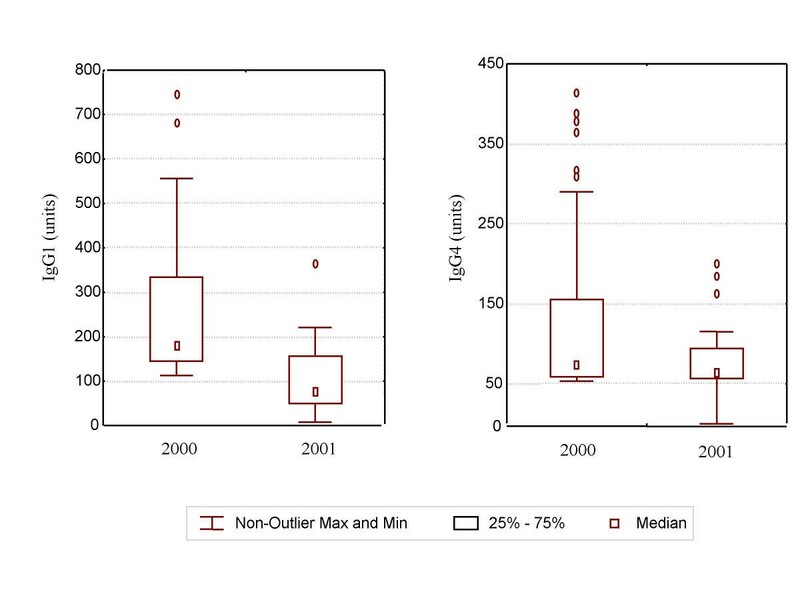 Infection prevalence in Culex mosquitoes was low at baseline, whether mosquitoes were dissected or pooled for PCR . Although infection prevalence declined following mass treatment, the decreases we observed were not statistically significant. One hundred sixty-one Mapou residents from 80 households had blood samples collected in both 2000 and 2001. The cohort was similar to the rest of the Mapou sentinel site population with respect to age (median, 18 years vs. 17 years, p = 0.89) and gender (48.9% vs. 54.0% female, p = 0.27) distributions. Of the 161 persons in the cohort, 126 (79%) were treated in the first MDA (Table 2). Antigenemia prevalence decreased from 15.0% to 8.7% (p = 0.004) from 2000 to 2001, while microfilaremia prevalence remained constant at 0.6% (2000, 1/161; 2001, 1/160). In 2000, the prevalence of antifilarial IgG1 responses was higher for persons ≤ 20 years of age (68.8%) than for persons > 20 years of age (44.8%, p = 0.003). Antifilarial IgG4 prevalence was similar for the two groups (≤ 20 years, 81.7%; > 20 years, 70.1%). Antifilarial antibody prevalence did not change significantly from 2000 to 2001 for either IgG1 (59.0% to 52.8%) or IgG4 (77.0% to 72.7%, Table 2). Median antifilarial antibody levels over this time period remained the same for both IgG1 (65.9 to 57.1 units) and IgG4 (57.6 to 58.0 units). Among persons in the cohort who received treatment (N = 126) antigenemia prevalence decreased significantly from 2000 to 2001 (14.7% to 5.6%, p = 0.002), antifilarial IgG1 prevalence significantly decreased from 60.3% to 46.0% (p = 0.001), while antifilarial IgG4 prevalence decreased only slightly (72.2% to 67.5%, p = 0.06, Figure 3). Treated persons had significant declines in median antifilarial IgG1 responses, from 68.5 to 43.0 units (p = 0.01), while antifilarial IgG4 responses did not change (57.5 to 55.9 units, p = 0.07, Table 3). Treated persons who were antibody-positive prior to treatment exhibited a significant reduction in antifilarial IgG1 levels (p = 0.003), but not in antifilarial IgG4 levels (p = 0.06; Figure 4). Antigen and antifilarial antibody prevalence for A, persons who received treatment (n = 126) and B, persons who did not receive treatment (n = 34) in 2000 (solid bars) and 2001 (cross-hatched bars). The error bar represents the upper 95% confidence interval. Among persons who received treatment antigen and antifilarial IgG1 prevalences decreased significantly. Among person who did not receive treatment, antifilarial IgG1 prevalence increased significantly. Change in antifilarial antibody response among antibody positive persons who received treatment by year. The error bars represent the non-outlier maximum and minimum values. Outliers were more than 3 standard errors away from the mean. There was a significant decrease in antifilarial IgG1 responses (p < 0.001). Among persons in the cohort who did not receive treatment (N = 34), Ag prevalence did not change from 2000 to 2001 (20.6% to 17.6%, p = 0.57) and antifilarial IgG4 prevalence did not change, (94.1% to 91.2%, p = 0.57), but antifilarial IgG1 prevalence increased (52.9% to 76.5%, p = 0.003, Figure 3). Median antifilarial antibody levels did not change for either antifilarial IgG1 (64.5 to 100.0 units, p = 0.10) or antifilarial IgG4 (61.5 to 96.4 units, p = 0.09, Table 3). Using SaTSCAN software (v2.1), we observed spatial clustering of noncompliance and of infection as determined by ICT testing. In 2000, untreated persons were clustered (p = 0.013, cluster radius 0.19 km). This cluster included 68 persons, 33 of whom were untreated. In 2001, there was significant clustering of Ag-positive persons (p < 0.019; cluster radius 0.67 km), which by visual inspection tended to occur in an area where drug coverage was low. In 2000, the average distance between the residence of an Ag-negative person and that of the nearest Ag-positive person was 37.7 meters (median = 20.2 m, range: 0–178.4 m). Average household antifilarial IgG1 levels in 2000 and household treatment coverage varied widely across Mapou. Similarly, average household antifilarial IgG1 response in 2001 was heterogeneously distributed (Figure 5). 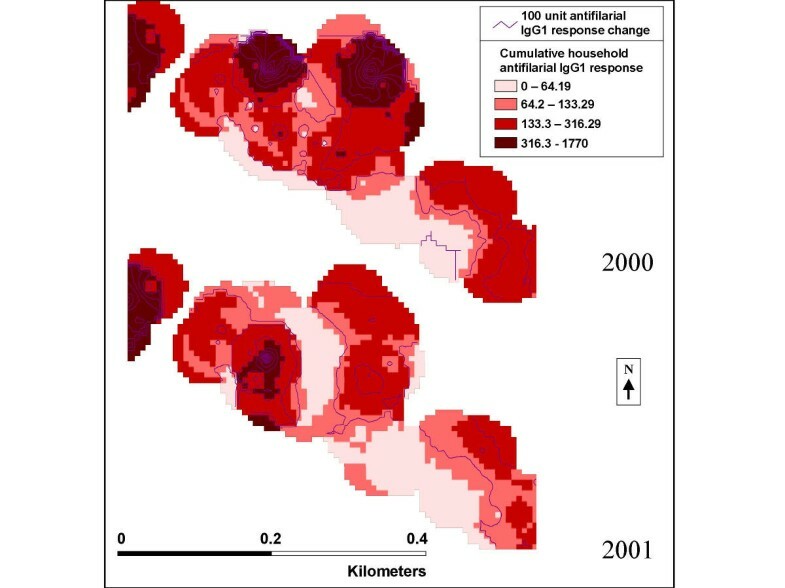 Spatial patterns (clusters of households) were evident for all three measures. Average antifilarial IgG1 response by household for 2000 (top) and 2001 (bottom), and percent of household members who received treatment (middle). The black line represents the road. Three numbered sections of the community are boxed. Average antifilarial IgG1 response by household were defined by: the small red circles represent a low level positive response for the household; the large red circles represent a high level positive response for the household; and the green circles represent a negative response. Household treatment coverage was defined by: the small orange circles represent households with no treatment coverage. The small light blue circles represent households with low treatment coverage. The large light blue circles represent households with high treatment coverage. Declines in antifilarial IgG1 levels were observed in households with the highest treatment coverage, while antifilarial IgG1 levels remained constant in households with low coverage (Figure 5). This was most evident in three clusters with high antifilarial IgG1 levels in 2000 (denoted by the sections 1–3) highlighted in Figure 5. Section 1 households had high treatment coverage and corresponding marked decreases in average household antifilarial IgG1 levels from 2000 to 2001, while sections 2 and 3 had low treatment coverage and stable or increased average household antifilarial IgG1 levels from 2000 to 2001. The effect of treatment coverage on total household antifilarial IgG1 responses can be seen on a finer scale in Figure 6, which displays section 3 from Figure 5 in greater detail, using smoothed contours. A descriptive spatial smoothing procedure, these contours take into account the summed antifilarial IgG1 responses from all persons in all households within a 50-meter radius of each house. There are two peaks in the top part of section 3 in 2000, which disappear in 2001, while another peak appears in the bottom part of section 3. In general, areas with increased household antifilarial IgG1 responses were associated with incomplete coverage during the MDA. Smoothed household antifilarial IgG1 response for 2000 (top) and 2001 (bottom) for the third boxed section of the community as identified in Figure 5. The purple lines represent change in total antifilarial IgG1 response by 100 units. The colored zones represent the total household antifilarial IgG1 level in the area of the community. The darker the red area the higher the total household antifilarial IgG1 level. The regression analysis showed that each 10-meter increase in residential distance from the residence of a person who was Ag-positive in 2000 was associated with a 4.68 unit (5.6%) decrease in antifilarial IgG1 levels in 2001, controlling for treatment status, age, and gender (p = 0.04, Table 4). Antifilarial IgG1 level decreased following treatment, controlling for the other variables (p = 0.03). Being > 20 years of age was associated with a decrease in antifilarial IgG1 level 2001, controlling for the other variables (p = 0.01). A separate regression analysis showed that residential distance from the residence of a person who was Ag-positive in 2000 was not a significant predictor of antifilarial IgG4 level in 2001, controlling for treatment, age, and gender. In the context of a mass drug distribution, we examined the spatial relationships before and after treatment between infection and antifilarial antibody levels in a community of low W. bancrofti infection prevalence and limited transmission. We chose an area of low infection prevalence to represent conditions that are likely to apply in endemic areas after several rounds of mass treatment. Such a setting also was chosen to highlight intra-community differences, which may not be as obvious in settings with high W. bancrofti infection. Understanding the relationship between infection and antibody levels may make it feasible to use antibody-based assays to define pockets of ongoing filarial transmission or, in contrast, to be confident that transmission is absent. A sensitive, specific antibody-based tool would prove useful to the filariasis elimination program in both the initial and certification phases of the effort. Our goal is to develop tools that will allow us to gauge the impact of the program on transmission and to conduct surveillance for residual transmission. Antifilarial IgG1 levels, suggested to be a potential marker of exposure to filarial larvae, have not been extensively characterized following mass treatment. Among treated persons, antifilarial IgG1 prevalence and levels declined significantly after treatment, whereas antifilarial IgG4 level, a potential marker of infection, remained unchanged, in contrast to previous findings. Wamae and colleagues (1992) found significant decreases in antifilarial IgG and IgG4 levels 180–720 days after treatment with DEC; however, their study population consisted only of microfilaremic individuals . The decrease in antifilarial IgG1 and the lack of change in antifilarial IgG4 that we observed may be a function of the relatively low infection loads in Mapou, compared to other studies conducted in the context of drug trials with patients who had high microfilarial densities. The regression analysis confirmed that at an individual level treatment was associated with a significant decrease in antifilarial IgG1 levels among Ag-negative persons. These results imply that treatment was associated with changes in either exposure or infection. Since the regression analysis excluded Ag-positive persons, it is likely that the decrease in antifilarial IgG1 level reflects a reduction in exposure to the parasite (i.e. a decrease in transmission) rather than a decrease in Ag load. The numbers of infected mosquitoes trapped showed little change in Mapou following treatment, however both the number of mosquitoes examined and the proportion infected were relatively small . 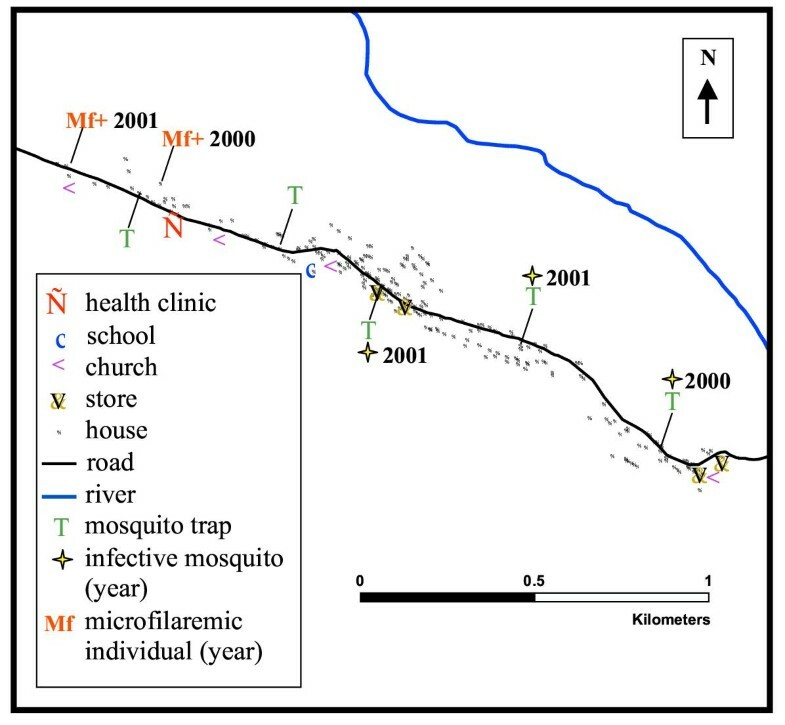 A number of methods were used to analyze and display the spatial distribution of measures of filarial infection, exposure to infection, and treatment coverage in Mapou. Spatial analysis also enabled us to examine the association between infected persons, incomplete treatment coverage, and the distribution of antifilarial antibody responses throughout the community. Using linear regression, we estimated the risk an infected individual posed to his uninfected neighbors. This analysis supported the conclusion that antifilarial IgG1 level may be a marker of new exposure to filarial larvae (i.e. marker of ongoing transmission). Increasing distance between the residences of Ag-negative and Ag-positive persons was associated with a significant decrease in antifilarial IgG1 level, controlling for the other variables. Every 100-meter increase in distance from the residence of an Ag-positive person was associated with a 56% decrease in antifilarial IgG1 level. Increases in antifilarial IgG1 levels may represent continued exposure and therefore, correspond to inadequate treatment coverage. Regression analysis indicated that residential distance from the residence of an Ag-positive individual was not associated with antifilarial IgG4 level and maps of antifilarial IgG4 levels showed little change between the two years. These data argue that antifilarial IgG4 levels are influenced more by current infection than exposure, as previously suggested [12, 13]. We expected the effect of the mass drug distribution to be community-wide, but our data provide strong evidence for micro-scale heterogeneity in the benefits of treatment, supporting the argument that LF transmission varies at a micro-scale and low or incomplete treatment coverage in an area possibly as small as a few households may influence transmission dynamics (Figures 5 and 6). It is possible that socioeconomic status might have influenced coverage levels, although most families in Mapou live in similar housing without electricity or running water. Instead, all households may not have been equally receptive to health promotion messages about the drug distribution. If so, the reasons for this are not clear. In the future, public health messages should place more emphasis on the importance of having one's neighbors receive treatment with antifilarial drugs. We had hoped that the entomological data could help us further define the spatial pattern of LF infection/transmission in Mapou. However, the small number of infected mosquitoes collected makes it difficult to comment on the presence or heterogeneity of transmission in the community. Practical limitations may prevent us from trapping adequate numbers of mosquitoes to demonstrate changes in transmission level. The detection of 3rd stage W. bancrofti larvae in mosquitoes collected in Mapou, even in small numbers, suggests continued low level transmission following the 1st MDA. Within a community, substantial heterogeneity at the household level in vector-specific factors (density, biting behavior, etc.) could exist. The influence of household and individual factors on LF transmission dynamics has not been fully described, but may be important in understanding the spatial heterogeneity of W. bancrofti infection. The cohort (~10–20% of the population) was similar to the wider Mapou population in terms of demographic variables and Ag prevalence, although participation was non-random; factors influencing participation in two consecutive years may have included health seeking behaviors, education, and socioeconomic status, some of which may have been related to infection status. Persons in the cohort were also slightly more likely to have been treated during the MDA than non-cohort Mapou residents. Results also may not be generalizable to other areas in Haiti, particularly communities with high infection prevalences. Antifilarial IgG1 levels in 2001 were used as the outcome in the regression analysis. It would have been preferable to use microfilaremia for these analyses; however, the number of Mf-positive persons was too small for this purpose (1 positive in each of 2000 and 2001, both persons with 1 Mf/20 μl). LF transmission dynamics probably depend on the presence of microfilaremic people throughout the community, not just the nearest person. Operationally, using the residence of the nearest Ag-positive individual was the most straightforward. Evaluating the influence of a network of multiple infected persons on antifilarial antibody status was difficult in a study of this size. We attempted to address these issues with the contour maps (Figure 6), which were based on data from all households within a defined radius, not just a household's nearest neighbor. Further studies will be necessary to refine this approach. One potential limitation of assaying antifilarial antibody responses with crude Brugia malayi Ag is the cross reactivity with other nematode parasites, including Strongyloides spp [4, 42, 43]. We performed additional analyses to address this issue and found that intestinal helminth infection status did not influence antifilarial IgG1 responses in multiple regression or spatial analyses. In the near future, recombinant Ag assays with greater sensitivity and specificity for W. bancrofti (and B. malayi) parasite exposure should be available . There is an urgent need for additional tools to help determine whether mass treatment is necessary in a given area and when mass treatment can be stopped. The role of the antibody assay using the crude Brugia malayi Ag in the monitoring program is at this point undetermined, but it has provided useful data that have helped to frame research questions, examine methods, and develop initial models to assist in measuring exposure. The current antibody assays certainly have given us a more detailed view of transmission in the Mapou community. Other investigations have noted marked spatial heterogeneity of microfilaremia, filarial disease, and antigenemia in study sites of different sizes [4, 10, 14, 24, 44]. Our results suggest that LF infection is heterogeneous on a much smaller spatial scale than originally thought and that transmission dynamics may vary over a distance of meters. From our results it is difficult to determine the community-wide effect of the MDA. There was little evidence of a "herd effect" of treatment and the benefits seemed to occur on a micro-scale level. If these results can be replicated, this could have an influence in determining where and how treatment programs are implemented and how certification surveillance is conducted. These data also emphasize the importance of achieving high and uniform levels of coverage in order to stop transmission. The degree to which the spatial heterogeneity of W. bancrofti infection and transmission adds to the difficulty of implementing or evaluating a national treatment strategy has yet to be fully understood. In a country such as Haiti, a majority of administrative units fall under the 'transmission possible but not certain' category; many of these might be changed to 'transmission present,' if more intensive sampling in the administrative units were done . Based on these uncertainties, any evidence of LF infection may be enough to warrant MDA, and MDAs may have to cover much wider areas than anticipated, if goal of interruption of transmission is to be realized. 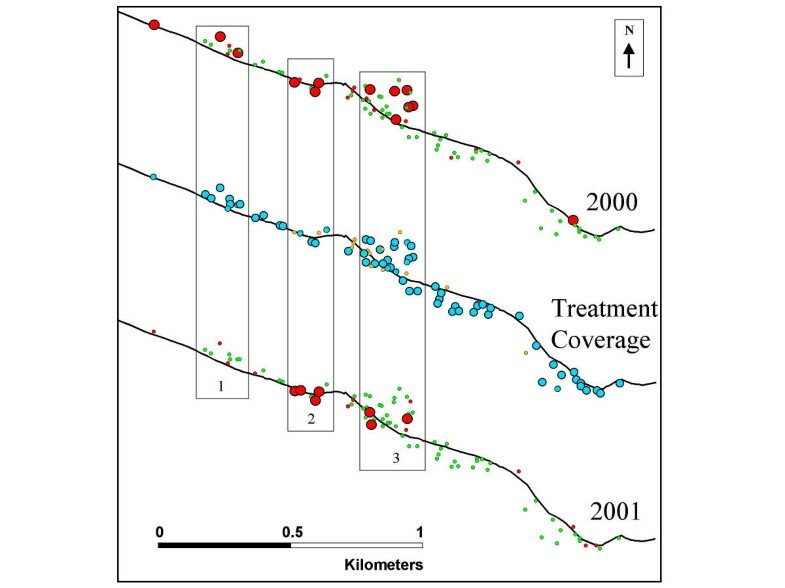 Finally micro-scale spatial heterogeneity of infection would make sampling and certification of areas as transmission-free an arduous task with the current tools. A consensus on how to approach and tackle these issues will be vital to the continued success of the LF elimination program. Funding for this study was provided by a grant from the Bill & Melinda Gates Foundation to the University of Notre Dame, the CDC's Emerging Infections Program, and the Emerging Infectious Disease Fellowship Program administered by Association of Public Health Laboratories and the CDC. We thank Els Mathieu for critical reading of this manuscript. We would like to thank Jean-Sony Sivilus and the entire Hopital St. Croix staff for their work in the sentinel sites. We thank the residents of Mapou for their cooperation and support for the program. We thank Stella Chuke and Benjamin Dahl for their ArcView advice, Lisa Mirel for her statistical assistance, and George Punkosdy for graphical presentation and Endnote help. PL, DA, MB, JL, and TS designed and coordinated the study, RL collected samples, JR and HB were responsible for collection of parasitologic data and for data entry, HB and RL were responsible for mapping, TS for collection of entomologic data, ML provided technical and editorial support, CW conducted ELISAs, data entry, statistical analysis, and AH performed statistical analysis. All authors read and approved the final manuscript.